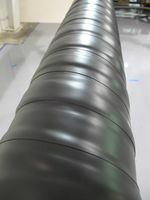 Guard-Wrap™ consists of a spunbonded polyester mat, saturated with microcrystalline wax that is laminated to a polyester film which is coated with microcrystalline wax. Its conformability makes it ideal for wrapping fittings. It also works well on straight pipe.